Reims, located in the north-east of modern France, hosted several councils or synods in the Roman Catholic Church. These councils did not universally represent the church and are not counted among the official Ecumenical Councils. The first synod, said to have been held at Reims by Archbishop Sonnatius between 624 and 630, is probably identical with that held at Clichy (Clippiacum) in 626 or 627. In 813 Archbishop Wulfar presided at a synod of reform (Werminghoff in "Mon. Germ. Hist. : Concilia aevi Carol. I", I, Hanover, 1904, 253 sq.). A council, usually called the Synod of St-Basle, was convoked at Reims by King Hugues Capet, assisted by Gerbert of Aurillac, later Pope Sylvester II, to consider the case of Arnulf, Archbishop of Reims, illegitimate son of the late King Lothair. Arnulf was accused of conspiring with his uncle, Charles, Duke of Lower Lorraine, against Hugues Capet. He was duly deposed by the council, and Gerbert appointed in his place. This was done without the approval of Pope John XV, who refused to accept either Arnulf's removal or Gerbert's appointment. The matter dragged on until 995 when Arnulf was restored, and was only completely resolved by Pope Gregory V in 997. Held by Pope Leo IX, this council inquired into simony. Hugo of Breteuil, Bishop of Langres, fled the proceedings, and was deposed. According to Eamon Duffy, "In one week, Leo had asserted papal authority, as it had never been asserted before". The Council also excommunicated Geoffrey Martel, for the imprisonment of Gervase, Bishop of Le Mans. In 1115, a synod was held at which the cardinal legate Cuno of Praeneste excommunicated Emperor Henry V.
In 1119, Pope Calistus II convened a synod for the purpose of concluding peace with Henry V. There were present 15 archbishops, over 200 bishops and as many abbots. 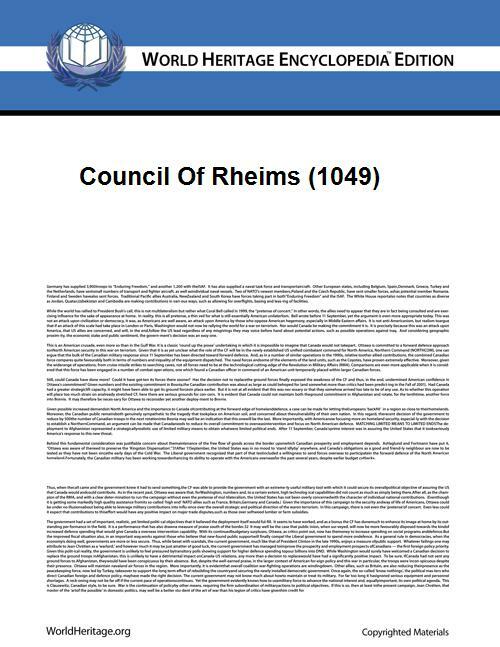 In 1131, a Council of Reims met. In 1164 Pope Alexander III presided at a synod which urged the crusade against Holy Roman Emperor Frederick I. In 1407 Archbishop Guido III convened a synod to abolish the abuses that had crept into the Church of Reims during the Western Schism. In 1528 Archbishop Robert III held a synod against Martin Luther. In 1564 Cardinal Charles of Lorraine convened a reformatory synod to enforce the Tridentine Council decrees. In 1583 Cardinal Francis of Guise held a synod at which 27 reformatory decrees were enacted. After a lapse of almost three centuries Cardinal Gousset, Archbishop of Reims, convoked a synod at Soissons in 1849; another, at Amiens in 1853; a third, at Reims itself in 1857. The acts of the last three synods are printed in "Collectio Lacensis", IV, 91-246.